This was the big stand-out winner for my garden in 2014, and a new absolute favourite for me. 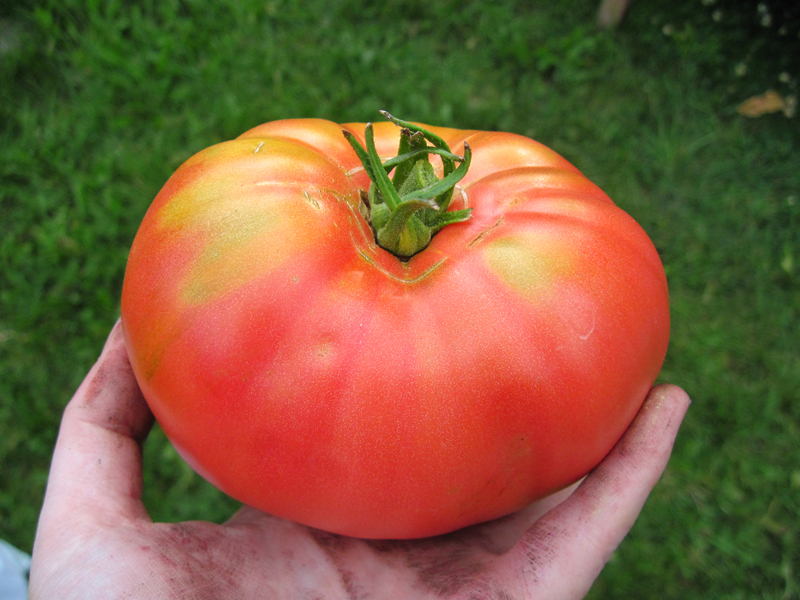 I was lucky enough to happen upon some seeds that Tatiana (of Tatiana’s TomatoBASE) was selling, and bought them more or less on a whim. I’m not sure if I’ve ever had a impromptu tomato purchase ever be so fortuitous. This variety is a heavy, heavy sprawler. I grows all over the place, and trying to keep it reigned in with staking only was almost impossible. I’m not generally a pruner, but this one I resorted to snipping off a few extra stems just to keep it from overtaking all the other tomatoes in the vicinity. Give this one room, and grow with a cage or Florida weave if possible, because it goes everywhere, and is absolutely unrelenting about it. 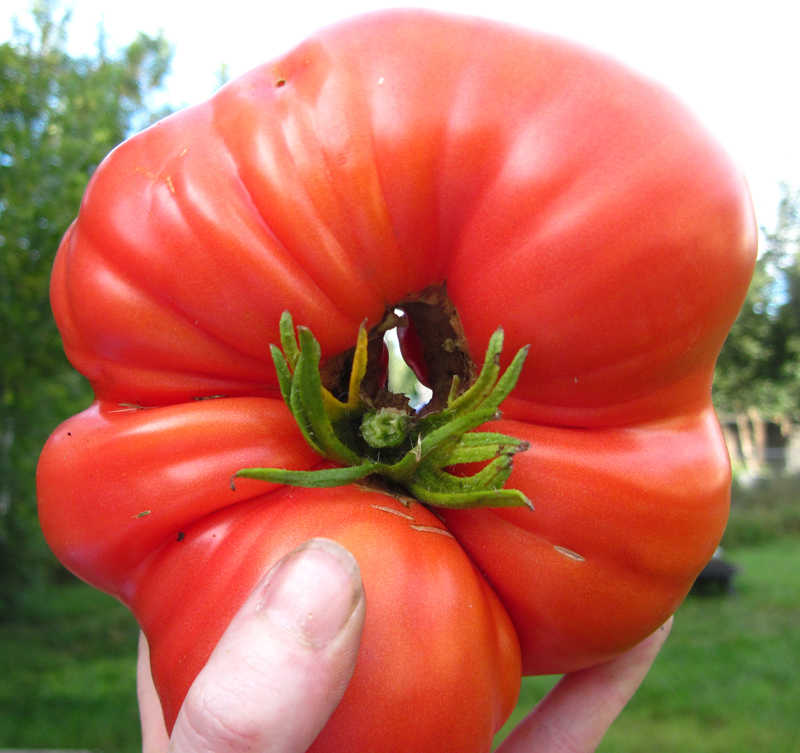 Another reason to make sure you keep this tomato secure – the fruit are massive. This variety is hands down the earliest monster variety I’ve ever grown. Coming in at 80-85 days, it’s a good monster variety for those with shorter seasons, and for those in longer-season climates, a great variety that keeps producing until cold finally kills it off. 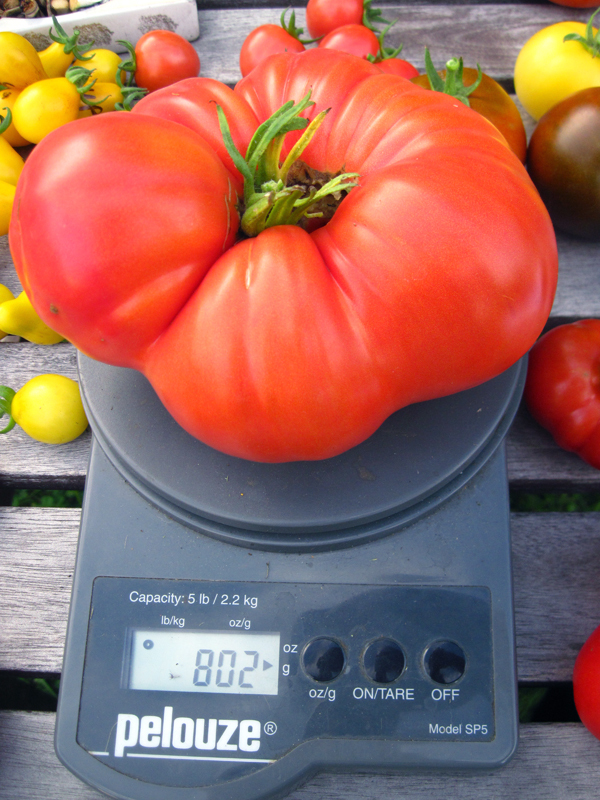 The average fruit weight for me was about 21oz (587gr) each. The smallest fruit I picked was 16 oz (454gr), and the largest was 28oz (802gr). I like irregular shaped fruits. A lot. Heavily pleated, weirdly bumpy, whatever, I’m down with it. This one definitely falls in the “irregular” camp, with no two fruit looking the same. Out of all fruit picked, I had two that were relatively smooth (one of which can be seen at the top of this post). The rest were all manner of shape. The fruit itself is oblate with pink skin and flesh, and a nice smooth, buttery texture. I even had one fruit that had grew a hole through the middle! In all the varieties I’ve grown, I’d never had that before. After chatting with Tatiana, she let me know that this variety does indeed produce one or two of these a season as a general rule. I keep the thing around for days, showing it to people who happened by my home. Most monster varieties, especially early ones, have flavour that leaves much to the imagination. Quite often you have to choose – are you going to go with quantity or quality? This variety, I was extremely pleased to find, is both. A lovely, smooth buttery texture and nice meaty fruit – without being dry. Sweet, but with a nice complex flavour to go along with it. This one is best for fresh eating, great for sandwiches and burgers (one slice will cover a whole piece of bread or a bun easily). I also roasted a bunch of these down just plain in the oven and ate them as is as a side dish, and they were absolutely delicious that way. If my gushing hasn’t made it obvious thus far, this one is a clear winner. The beating, direct sun of my garden didn’t produce any sun scald, I didn’t see evidence of any catfacing or splitting in our dry conditions, and I didn’t see any other evidence of disease. On average, I got about 14lbs out of this plant, and while it’s creeping up to an end of season variety here on the short-season prairies, it would be great for longer seasons as well where a gardener could easily harvest even more than that. This is one of those varieties that I will be singing the praises of until the end of my days. This is definitely a variety that deserves to be more widely grown and recognized for its great qualities.